London Book Fair and Indonesia’s cultural program team met at the Sharjah Book Fair to plan for March’s Market Focus program at Olympia London. 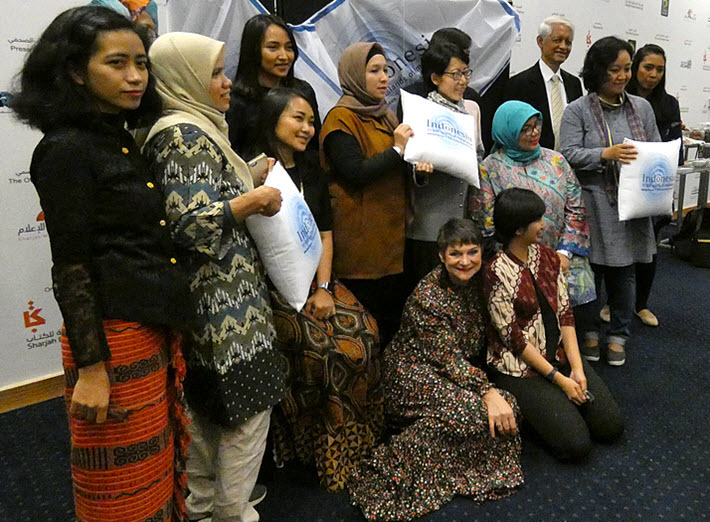 Twelve Indonesian writers have been announced to participate in cultural programming around the country’s spotlighted presence at London Book Fair, March 12 to 14. Called Market Focus in LBF’s lexicon, this is the show’s guest-market-of-honor program, and Indonesia proved several years ago as Frankfurt Guest of Honor that it can produce a memorable presence with ample rights and licensing opportunities for the fair’s trade visitors. At the Sharjah International Book Fair, which closes this week, LBF director Jacks Thomas, Orna O’Brien, and Helen Clifford met with Jakarta’s National Book Committee chair Laura Prinsloo about Indonesia’s coming spring showcase in the UK. Agustinus Wibowo – A prominent travel writer whose bestselling travel memoir, Zero: When Journey Takes You Home, soon will be made into a film. Through his work he explores not only other cultures, but also what it means to be Indonesian today. Clara Ng – An award-winning author, known for both adult fiction and children’s literature. She has written several novels and short story collections, 21 children’s books, and several collections of fairy tales. Dewi Lestari – “Dee,” as she’s known, is a bestselling novelist and short story writer whose six-volume Supernova series has been adapted into several hugely popular films. She’s also a popular singer-songwriter. Faisal Oddang – A young and prolific author from Sulawesi who has published an award-winning novel and collections of short stories, poetry, and essays. He also has garnered several national literary prizes and participated in two international residency programs in 2018. Intan Paramaditha – A novelist whose literary work explores gender, sexuality, culture and politics, Paramaditha’s short story collection Apple and Knife will be published in the UK by Harvill Secker later this year, as will her first novel The Wandering, in 2020. Laksmi Pamuntjak – Poet, novelist and short story writer, she is also known for her food writing. Her first novel, The Question of Red, has been published in several languages and her second novel, The Birdwoman’s Palate, was recently published by Amazon Crossing. Here’s Publishing Perspectives‘ report on a panel discussion with Pamuntjak at Frankfurter Buchmesse last month. Leila S. Chudori – An award-winning novelist and journalist, she has also written for television and film. Her bestselling first novel, Home, has been translated into six languages and her second novel, The Sea Speaks His Name, has also won national and international praise. Nirwan Dewanto – Poet, essayist and esteemed cultural critic who has twice won Indonesia’s top literary award for poetry. He has participated in several international residency programs and samples of his work will appear in the Spring edition of Stand, a UK literary journal. Norman Erikson Pasaribu – An emerging voice in poetry, fiction, and nonfiction. His first collection of poetry, Sergius Seeks Bacchus, won a PEN Translates Award and will be published in the UK in March 2019 by Deborah Smith’s Tilted Axis Press. Reda Gaudiamo – A YA short story writer who is also a nationally known singer, particularly of poems turned into songs. Her adult collection, Tentang Kital/About Us and chapter book for children, The Adventures of Na Willa, will be published in the UK by The Emma Press. Seno Gumira Ajidarma – A prolific author of nonfiction, short stories, essays, screenplays, and reportage. He has won numerous literary awards both in Indonesia and abroad and is well known as a consistent advocate for free speech and freedom of expression. Sheila Rooswitha Putri – A comics artist known for her blog posts in which she references everyday life in Jakarta and the urban condition. Her unique style has attracted invitations to many conventions and group exhibitions, both in Indonesia and abroad. In a prepared statement on the announcement of the “Jakarta dozen” writers headed for London in the spring, LBF’s Thomas is quoted, saying, “As the first Southeast Asian country to be Market Focus at London Book Fair, we’re greatly looking forward to hosting Indonesia in 2019. There is a huge interest and appetite across English-language publishing and beyond for more content from this region. This is an exciting and diverse author lineup, as you’d expect from a country comprising 17,000 islands and 260 million people. Speaking for the Indonesian National Organizing committee, Prinsloo is quoted, saying, “Indonesia’s presence as Market Focus at London Book Fair 2019 marks an especially important moment in the country’s effort to promote Indonesian content abroad. This journey is one that began several years ago and has thus far resulted in the sale of more than 1,000 Indonesian titles to foreign publishers. As London’s Market Focus country, Indonesia hopes to promote exponential growth in the sale of titles—and knowledge of Indonesia—abroad. And for the British Council’s literature program, its director, Cortina Butler, is quoted, saying, “Indonesian literature deserves to have the widest of international audiences and in this group of authors, we have exciting representatives of rich strands of writing in Indonesia today across generations and genres. “This is a very special opportunity to gain insights into some of the leading voices in fiction, nonfiction, poetry and other creative writing and through them into one of the most complex of contemporary nations whose literature is informed by unique history and geography. More about London Book Fair is here, about Indonesia is here, and about Sharjah International Book Fair is here.